Daryle Singletary earned his notoriety for country authenticity with such unforgettable hits as 'I Let Her Lie',' Too Much Fun', 'Amen Kind of Love' and 'The Note'. His newest album, 'There’s Still A Little Country Left' , finds the country singer smack dab in the middle of what he loves the most, traditional Country music. On past albums, some of the greatest talents in his industry have lined up to sing with Daryle, including the late George Jones and Johnny Paycheck, Dwight Yoakam, Merle Haggard, Ricky Skaggs, John Anderson and Rhonda Vincent. 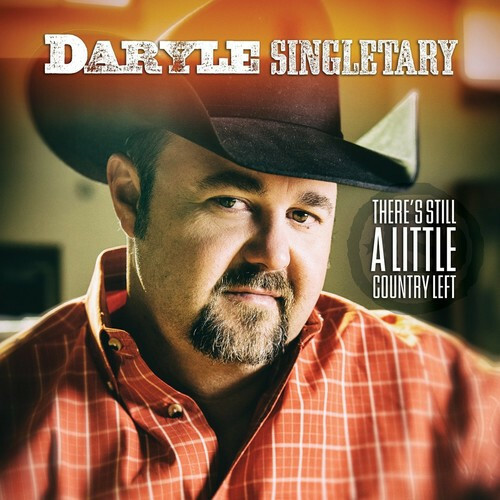 On 'There’s Still A Little Country Left', Daryle finds harmony vocal assistance from Grand Ole Opry member Vince Gill on the poignant and moving 'Say Hello To Heaven'. Daryle was from rural Georgia. His father is a retired postmaster and his mother is a hair dresser. They sang gospel music on weekends. By the time he reached his teens, Daryle was a rabid country music fan, enthralled by the sounds of Keith Whitley and his all-time favorite, Randy Travis. He moved to Nashville in the fall of 1990 and made the rounds of Music City’s nightclub talent contests, picking up $100 here and there. Producer Greg Cole began playing drums in his band at a club called The Broken Spoke. Daryle recorded a pair of singles for the independent label Evergreen Records in 1992, but neither was a success. In the meantime, he was badgering his idol with letters. After members of the Randy Travis band heard Daryle at The Broken Spoke, they urged the star to listen, too. With Randy as his co-producer, Daryle Singletary issued his debut album on Giant Records in 1995. It included the career-launching singles 'I'm Living Up to Her Low Expectations', 'I Let Her Lie', 'Too Much Fun' and 'Workin’ It Out'. Traditional honky-tonk fans shouted 'Hallelujah!' in response. Customer evaluation for "There's Still a Little Country Left (CD)"